Discover beautiful Mallorca with this private shore excursion. When your ship docks in Palma de Mallorca port, meet your guide and set off to explore the surrounding sights in your own personal vehicle. Venture to hilltop Bellver Castle for views of Palma, the Royal Palace of Almudaina and the Cathedral of Santa Maria (La Seu). Explore Valldemossa, said to be one of Mallorca’s prettiest villages, and drive through Deia and Llucalrari. Visit Sa Foradada, Soller Valley and the Serra de Tramuntana mountains, and enjoy a Palma Old Town walking tour. After your cruise ship drops anchor in Palma de Mallorca’s port, you’ll greet your private guide and board an air-conditioned coach destined for Bellver Castle — a Gothic 14th-century fortress shrouded in history. From Bellver Castle’s hilltop perch, you’ll absorb beautiful views of the Mediterranean coast and Palma port before learning about the city’s past and present in the City History Museum. 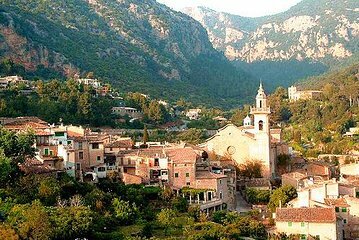 Continue to Valldemossa — a picturesque village surrounded by the Tramuntana mountain range — to take a guided tour of the village. Houses and streets are swathed in flowers and plants, so spend some relaxed free time refreshing in a café. Then, venture to Sa Foradada rock — a magnificent rock that boasts an enormous incision in its center — to capture fantastic views of the UNESCO-listed Serra de Tramuntana mountain range. Following this, you’ll enjoy a sightseeing tour of Dela, a quaint coastal village, and Llucalcari, a historical town surrounded by olive groves and pine trees. After relaxing among the natural splendor of the Soller Valley, you’ll travel back to Palma de Mallorca to visit impressive landmarks such as Palma La Seu Cathedral and Almudaina Palace. Learn of the city’s history from your guide before returning to your cruise ship well in advance of its departure. We will ensure your timely return to Palma de Mallorca port for this activity. In the rare event your ship has departed, we will arrange for transportation to the next port-of call. If your ship is delayed and you are unable to attend this activity, your money will be refunded. See our terms and conditions for full details. Great experience and tour guide. This was a PRIVATE tour for our group of 7. Your agent No Frills Excursions sent a mini coach for over 20 people to pick us up. The obvious intention was to add on other passengers. Also as it happened 5 persons from our group did not join the tour as they were very tired from the previous day's tour. The guide told us that since 5 persons in our group were not coming he was taking other passengers. This was not true as he had already come with a mini coach. Then he told us that since the other passengers had Valledemosa on their itinerary, he was going to skip the Palma sightseeing and take us to Valledemosa, Deia and Sollet Valley. Hence we could not see the beautiful Cathedral of Palma. Also after we had gone a few miles, he told us that he had to pick up some more people from the Port and so the coach returned to the Port to pick up 3 more people. Then despite the delay, he gave a half hour break in Valledemossa and in Soller valley. As a result of all this, we barely managed to get back to the cruise ship 5 minutes before the All Aboard time of 6.30 pm. The guide had told us that if we had time on our return trip he would take us to the Cathedral to take some pictures. Even that could not be done as we simply had no time. To say that we were very very disappointed on this tour would surely be an understatement! !